WARNING! THIS PODCAST CONTAINS SORCEROUSLY EXPLICIT MATERIAL. Welcome to The Hall of Blue Illumination, the podcast dedicated to the world of M.A.R. Barker’s Tékumel. Double-check your diagrammes and sharpen your sacrificial daggers, because in this episode our hosts discuss The Book of Ebon Bindings. 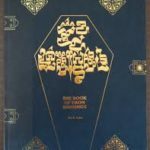 This legendary, out-of-print work is a fascinating and unique piece of Tékumel. Our hosts describe The Book, discuss its content, and offer some theories on the motivations behind its creation. [00:01:25] The Book of Ebon Bindings is currently out-of-print. The Foundation wants to re-release it in the future. [00:01:45] When was the first edition released? The second printing says the first printing was 1979. [00:02:27] Professor Barker did the layout for the first and second editions on his own typewriter. [00:02:37] The Theatre of the Mind edition has a copyright of 1978. [00:03:00] Victor briefly leaves to attempt to sort this matter of publication dates. He returns with a copyright date of 1978. [00:04:09] Warning! Discretion advised. Children are especially susceptible to the demonic influences to be found inside. [00:04:58] James relates a rumored origin of The Book of Ebon Bindings: that it was an attempt by Professor Barker “to tweak sensibilities”, and comment on concerns regarding the subject-matter of fantasy gaming. [00:05:49] While Victor can’t speak to the Professor’s motivations with respect to The Book of Ebon Bindings, he can say that at the time, the Professor and his players had nothing but contempt for concerns about gaming’s effect on children. Most of the gamers back then had the attitude that the world was a dangerous place, and to pretend that gaming was unusually problematic was silly. [00:09:25] The Book was released three years into the publishing history of Tékumel and several years before Swords & Glory Vol. 1, yet remains one of the longest pieces of Tékumel source material. So why The Book of Ebon Bindings? The Professor discusses this in Dragon #11. [00:11:05] Even original EPT had demons. The Professor is trying to outline cosmic relationships, using these big monsters. Kurritlakál appears in EPT’s Example of Play (§2810, p. 102). Even there, it’s clear that the intent is that demons should be special and different from the other monsters on Tékumel (which are all, on the whole, much more dangerous than those of Dungeons & Dragons). [00:12:58] Professor Barker got many more questions than he answered in the “Seal of the Imperium” columns. In Dragon #11 (question #4), the Professor responds to a question about demons, and his answer is both thorough and fascinating. [00:17:18] In some ways , the introduction to The Book of Ebon Bindings is the real “meat”. [00:18:27] Were Trasüné hiTánkolei and Kalusü hi Viridáme PCs? Victor encountered Kalusü (a high-ranked priestess within the Temple of Ksárul) as an NPC, but these two individuals may have been PCs in the late 1970s. [00:20:15] Backing up the Tubeway Car: What is The Book of Ebon Bindings? It includes two major sections. The first is an introductory essay written in character by a philosopher priest. The second is The Book of Ebon Bindings proper, also written first-person. It contains a catalog of various demonic entities. [00:21:55] The Book of Ebon Bindings is both a game supplement and also meant to be a representation of a thing existing in the world of Tékumel. This makes it unique as a work. [00:22:20] Like other fictional grimoires, it was in part inspired by the seventeenth century work The Lesser Key of Solomon. The Key is a catalog of demonic entities for alchemists and scholars. Scott notes that the sigils and introductions of the various demons in the Key are similar to those found in The Book of Ebon Bindings. [00:23:50] For gamers and sci-fi and fantasy fans of the era, the Key and historical works like it were all grist for the mill. Professor Barker would have been familiar with it. [00:25:00] The anecdotes of The Book of Ebon Bindings can be very entertaining. Offhand references and little hints regarding aspects of Tékumel are part of its appeal. [00:26:15] James has used The Book for its references to locations, people and places of Tékumel’s forgotten past, information whose context would be lost even to modern Tsolyáni. [00:28:40] If there’s anything you should get out of The Book of Ebon Bindings, it’s that the world is far stranger than you can even imagine. [00:29:22] For instance, is the Salarvyáni deity Shiringgáyi an amalgam of Avánthe and Dlamélish, or is she something else? The answer the Professor suggests is you’ll never be able to understand the answer to that question. [00:30:02] You’re not always going to find canonical answers to your questions. A lot of gamers dislike games where they can’t get these answers. Of course, the referee can decide these matters, but even this might not satisfy some players. [00:32:40] An excerpt from the entry on Origób (BEB, p. 23) illustrates the Professor’s mastery of language and description. The Book isn’t an atlas like Swords & Glory Vol. 1, it’s a much more entertaining document. [00:34:05] Victor sees similarities between this language and the work of Clark Ashton Smith. All three of our hosts agree that Smith’s works exerted a much greater influence on the Professor than those of Lovecraft. Phil thought of Lovecraft as a bit of a one-note bore. Jack Vance also stands out as an influence. [00:37:00] Victor compares and contrasts the Origób entry in The Book of Ebon Bindings with that in EPT (§1700, p. 80). The Origób of EPT is essentially a game construct. [00:41:44] On some level, The Book of Ebon Bindings is an attempt to re-mythologize demons, so that they weren’t so much like regular monsters. Gods, Demigods and Heroes was published 1976. Could The Book of Ebon Bindings have been a reaction to D&D giving game statistics for the gods? [00:42:53] Consider this, there are no game mechanics in The Book of Ebon Bindings. [00:43:20] The art in The Book of Ebon Bindings is a mixture of Professor Barker’s own work, and that of one of his players at the time, Craig Smith. [00:44:00] Does Craig Smith still do art? (GPD: I haven’t found anything, so indications are…no?). [00:44:05] Shortly after producing The Book of Ebon Bindings, Imperium Publishing ceased operations, largely due to a disagreement between some of the people involved at the time. This, in part, was related to a dispute between Professor Barker and TSR over royalties. [00:45:50] A description of the art for the demon Marággu (BEB, p. 40). Is this type of illustration an indication that The Book wasn’t meant for a broad audience? Victor indicates that it is instead evidence of the “we’re all adults here” attitude among gamers at the time. This is not all that different from things that would show up in The Arduin Grimoire. [00:48:41] At the time Scott discovered The Book, D&D was going “the kiddie route” by producing a cartoon and attempting to appeal to younger audiences. [00:49:07] James is slightly disappointed by the art, because it’s clearly twentieth century art. He would have preferred to see something that better approximates the illustrations the Tsolyáni would produce. [00:53:40] Victor finishes with a quote from the preface on page vi. Hosts: Scott Kellogg, James Maliszewski, and Victor J. Raymond. The Book of Ebon Bindings is fantastic, but currently out-of-print. The 1978 (or was it 1979?) edition was published by Imperium Publishing. Theatre of the Mind Enterprises re-printed it in 1991. Empire of the Petal Throne is the original Tékumel sourcebook and rules set. It was first published by TSR in 1975. It can be purchased as a print-on-demand book, or as a PDF from RPGNow. Swords & Glory Vol. 1 was first published by Gamescience in 1983. It is a detailed sourcebook for the world of Tékumel. You can purchase it as a PDF or in print at RPGNow. The Lesser Key of Solomon is a seventeenth century grimoire covering demons. You can read a translation, and view the accompanying illustrations free-of-charge here. Gods, Demi-Gods and Heroes was released by TSR in 1976 for Dungeons & Dragons. It is the first sourcebook to detail various mythological and fictional pantheons for D&D, and to provide statistics for these deities. The first edition of Deities and Demigods was first published by TSR in 1980. It saw several re-printings, and was later repurposed into the first Legends & Lore. Like Gods, Demi-Gods and Heroes it provides game information on a variety of mythological and fictional gods for the D&D setting. Arduin is a roleplaying game and setting written by David A. Hargrave, and originally self-published in 1977. Several subsequent publishers have released products for Arduin, most notably Grimoire Games. Early on, Arduin incorporated material from genres beyond traditional medieval fantasy. Anthony Pryor has a lengthy overview here, but beware the NSFW image halfway down. You can email us at citizen@tekumelpodcast.com. You can also find us at our website, on Twitter, or on Facebook. I love getting the backstory on this book! I grew up with all the moral panic about Satanism and D&D, but I was attracted to gaming anyway. The frisson of the forbidden was part of the appeal, as well as the insight that the panic was based on mistaken assumptions. Or…was it? I was shaken to my Evangelical-raised core when 12 year old me saw the shrink-wrapped copy of what must have been the 1991 edition, all evil-lookin’ letters in gold foil and a warning sticker that it contained demon-lore and was not for children!! Holy cats, there was something dangerous amongst the halflings and brass dragons after all! It was deeply troubling in the moment, but such an outlier from the general run of gaming products that it never affected my interest. In the last 10 years I got interested in Tékumel, got ahold of a PDF version of BoEB, and was startled to realize it was nothing other than the mysterious book of awkward adolescent experience. And while the sacrifices and summoning components are not pleasant, their value for giving detail and color to sorcerors’ activities is clear enough. The tie to Clark Ashton Smith and Jack Vance through black humor seems solid. Thanks for the ep, I have been enjoying your podcast highly in this, my Nth wave of interest in Tékumel and EPT. The “frisson of the forbidden” is an absolutely delicious phrase! Thank you for the story, and we’re glad that you enjoy the podcast. In regards to Arduin, both Hargrave and professor Barker shared some commonalities. Both of them where world travelers ( Hargrave through the military, Phill through teaching and religion), we’re fans of history and sci fi/ fantasy ( especially Vance and Smith), they were devoted to their campaign worlds, and both had a keen intestinal in the darker aspects of life. They even looked a little bit like one another. They are both seminal figures in RPG history, to be sure! Also, just like Phil, Hargrave too had his own lesser and greater demons, and what specialities they were known forever if you summoned them. Dave too even found the idea of attributing stats to the gods ( such as in D&DG) a bit too much, even for his “ over-the-top “ tastes. Check the Goetia from the European Renaissance for the root documents!